Despite research citing the numerous health and academic achievement benefits of physically active young people, most do not engage in the recommended levels of 60 minutes of daily physical activity. Moreover, opportunities for physical activity in schools vary from state to state and also at the local level. Students living in low-income communities and communities of color often have fewer opportunities to participate in regular physical activity. Physical education and physical activity should be equally and consistently provided to all students in all grades, no matter where they live or go to school. 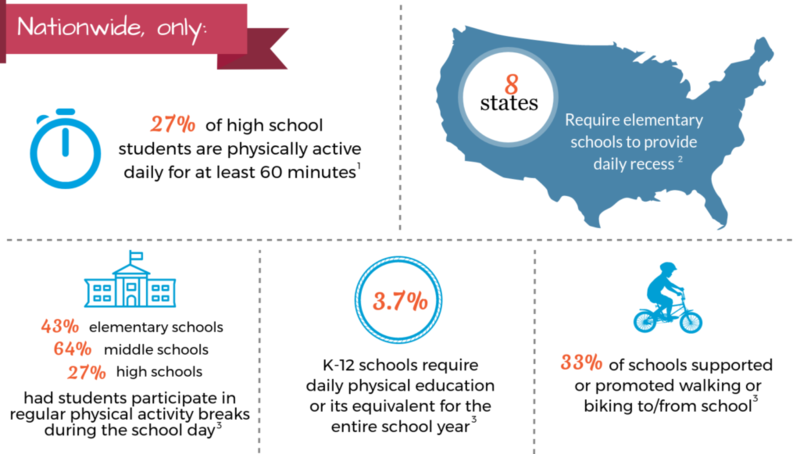 To learn more about the current state of physical education and physical activity, view and/or download our data briefs. 1 Centers for Disease Control and Prevention. Youth Risk Behavior Surveillance – United States, 2015; 2016. 2 SHAPE America – Society of Healhty and Physical Educators. Shape of the Nation Report; 2016. 3 Centers for Disease Control and Prevention. School Health Policies and Practices Study 2014; 2015.